QQMaster BBQ Grill Light LED with 9'' Left Handle,Green Egg Accessories BBQ Lights for Grill Outdoor LED Barbecue Lamp for Big Green Egg,Some KJ Models with 24 Ultra-Bright LED Lights Battery Powered by QQMaster at Outlet Shopping Guru. MPN: Asin. Hurry! Limited time offer. Offer valid only while supplies last. QQMaster New BBQ Grill LED Light provides excellent illumination for the entire grill surface.No more cell phone lights needed to check your grill. QQMaster New BBQ Grill LED Light provides excellent illumination for the entire grill surface.No more cell phone lights needed to check your grill. The Ultra-Bright 24 LED light and mounting bracket make it the perfect for you to grill after dark. so you can enjoy the barbecue time with family at night! Ultra-Bright LED Lights,Powder Coated Bracket ,Polycarbonate Lens for Xtra-Heat Resistance. The BBQ grill light is made of high quality ABS plastic, which has the characteristics of high temperature resistance.Really suitable for outdoor use, especially BBQ party at night! Light Size:4 inch Length x 2.5 inch Width x 1.3 inch Height ,Metal Bracket Size: 4.5 inch L x 2.5 inch W x 1 inch H,fit newer green egg Model with 9-inch handle (mounted on right side of handle) and older KJ& BGE models with 4-inch handle (mounted on left side of handle using single nut). 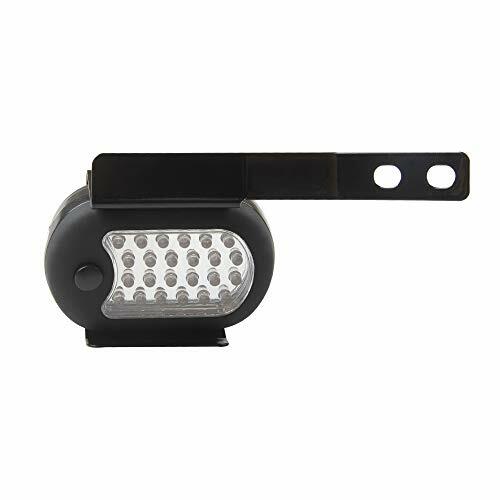 The BBQ grill light canister can be easily removed from the mounting bracket and stored indoors,easily attaches to the Top Grill Handle using existing nuts & studs. The package didn't include batteries,you should install 3 AAA batteries by yourself. DO NOT expose to high heat for extended period of time. NOT WEATHERPROOF. Store indoors when not in use. ☀SUITABLE TYPE - 1-Arm Fits: All newer BGE models (9" handle) grills. 2-Arm Fits: All KJ & older BGE (4" handle) grills. ☀SURPER BRIGHT - This BBQ grill light have 24 super bright LED lights, brightens your entire grill(Doesn't include 3 AAA batteries). ☀TWO MODES LED LIGHT - An area light and a directional light. Include 360 rotatable hook for hanging, magnet on back and the flat sides allow you to focus light where you need it. ☀NOTICE - Please keep the lights away from fire! Don't use it at the high temperature for a long time.NOT WEATHERPROOF. Store indoors when not in use. ☀MULTIPLE USES WITH STRONG MAGNET - The outdoor grill light With strong magnet,360° hook&Bracket, it can be used as a simple BBQ grill light for any gas, charcoal, or electric grill. Also, you can put it into use as a flashlight for camping, reading, biking, or use it for other dark place. It is not only the best BBQ grill accessories, but also a practical lighting equipment for daily use. If you have any questions about this product by QQMaster, contact us by completing and submitting the form below. If you are looking for a specif part number, please include it with your message.